With over 20 commitments that explicitly reference our services, and many more of direct relevance, the NHS Long Term Plan is significant for the 14 allied health professions. New service models – such as urgent care, community and intermediate care, and expanded community multidisciplinary teams. More NHS action on prevention and health inequalities. Progress on care quality and outcomes – including cancer, radiotherapy, postnatal continence, mental health, cardiac rehabilitation, stroke rehabilitation and pulmonary rehabilitation. This is both significant for AHPs and the patients and populations we serve. Over the next few months the national AHP leadership team will work together to support the implementation of the NHS Long Term Plan by developing our work on AHPs into Action. Working with colleagues across health and care, we will identify how best to support Integrated Care Systems, commissioners and providers in maximising the contribution of AHPs to achieving the ambitions set out in the plan. The Secretary of State has asked Baroness Dido Harding to take forward the development of the workforce implementation plan. To support this work I will lead the AHP Future Workforce Group, engaging with the professional bodies and other key partners on priorities for the AHP workforce. But what does this mean for AHPs? To achieve the ambitions set out in the NHS Long Term Plan AHPs will need to step forward, lead change, and work in partnership with health and social care colleagues across local systems. The Chief AHP Officer awards 2019, launched this month, are an important opportunity to recognise where AHPs are already making a significant difference to priority areas in the Long Term Plan. I encourage you to submit your examples of improving and transforming services. This summer the annual Chief AHP Officer’s conference on 18 July 2019 will focus on the key areas of the Long Term Plan for AHPs. This will open for bookings in February. You can also join a @WeAHPs tweetchat on the NHS Long Term Plan on Thursday 31 January and discuss AHP perspectives from around the country. There is much for AHPs to contribute to and engage with in the coming months and years. The NHS Long Term Plan very much sees AHPs as intrinsic to improving care. With leadership and support from AHPs around the country, we will maximise the benefit for our patients and populations. 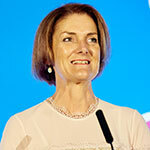 Suzanne Rastrick is Chief Allied Health Professions Officer, NHS England. She qualified as an occupational therapist in Oxford in 1986, and began her career in the acute hospital sector, moving to practice in community and primary care where she then gained her first general management role. Suzanne was one of the first allied health professionals to hold a substantive Director of Nursing post, and has since held these roles in both providing and commissioning organisations in the NHS. She has also been Chief Executive of a Primary Care Trust Cluster, and achieved authorisation for a large Clinical Commissioning Group with an integral commissioning support unit. She has a Non-Executive portfolio in the commercial and not-for-profit housing sector, and sits on a number of national groups including NHS Employers Policy Board, Health Education England AHP Advisory Group, and England Centre for Practice Development National Advisory Board. Suzanne was appointed as Chief Allied Health Professions Officer for NHS England on 1 September 2014. This role also has key professional leadership relationships to the Department of Health as well as to Health Education England.